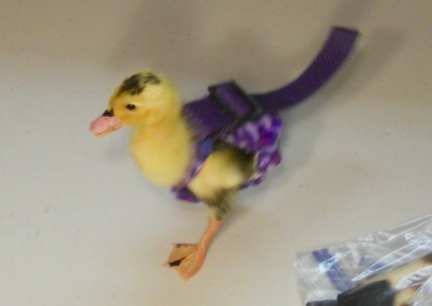 Duck Diaper Holders are, in my opinion, the only way to have a duck in the house, vehicle or lap. This one is my own design that I fashioned for our own gosling, Eden and Ducklings, Splash & Phebe. This Diaper Holder is for a Ducking that has outgrown the hatchling size and ready for the next Diaper Holder See photo for color of the item you will receive. (may vary just a bit). Ducklings grow so fasssssst! If it arrives and it would be a bit too big, wait a day or two (literally) and try it on your baby duck/goose again. 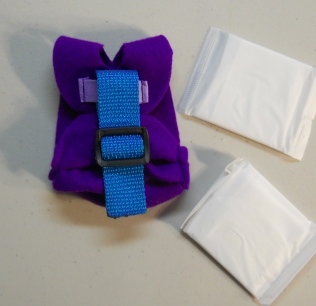 The Duck Diaper Holder comes to you with two Pantie Liners to get you started. We line our own Diaper Holders with pantie liners cut in pieces for the real young birds and grow the liner as the bird grows. We send two of these along with the Diaper Holder.